That sums up the summer of 1998 perfectly. Perfect closure. 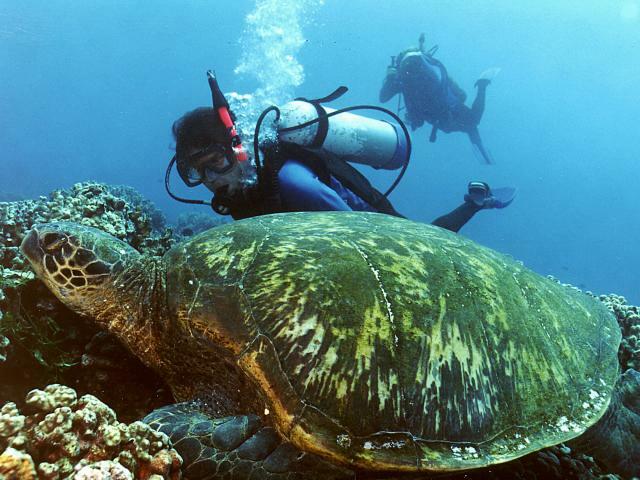 Experts arrived and saw the Honokowai honu for themselves. All were so charmed they've already expressed resolve to return to dive again with them next summer. Perfect, perfect, perfect. And if that weren't enough, our celebration of the 25th Anniversary of the French Frigate Shoals continues unabated. As I type this, George Balazs and Marc Rice are both at East Island, French Frigate Shoals, monitoring late nesters. They hope to attach transmitters to some of these turtles and track their paths to their home foraging sites. 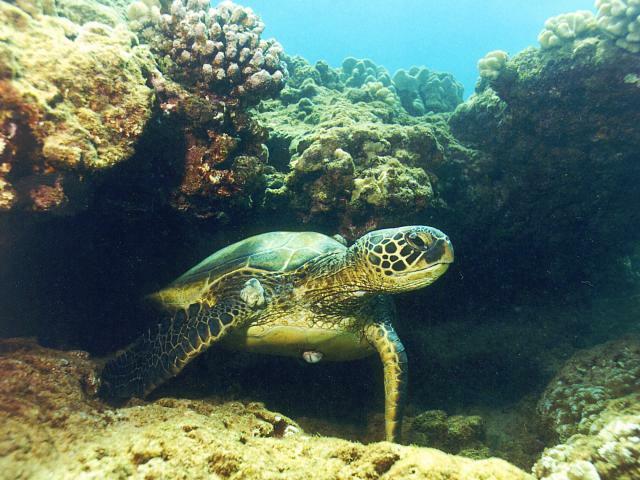 Turtle Trax will follow right along, thanks to the stats the National Marine Fisheries Service in Honolulu will provide. Since a picture is worth a thousand words, here are nine favourite photos we feel best represent the Summer of 1998. Polzbarney, a turtle we have known since 1995, showed a beginning tumor on his right shoulder last year. It was the size of a Smartie in 1997. You can see what the tumor looked like 10 months later. Peter videotapes Raphael, a turtle we have known since 1992. She had acquired fibropapilloma (FP) but showed signs of improvement in 1996. We did not see Raphael in '97. This summer all hint of FP was gone; however, the turtle was filthy with a new type of barnacle we had never seen before. By summer's end, we determined that most Honokowai turtles have these strange new skin barnacles. 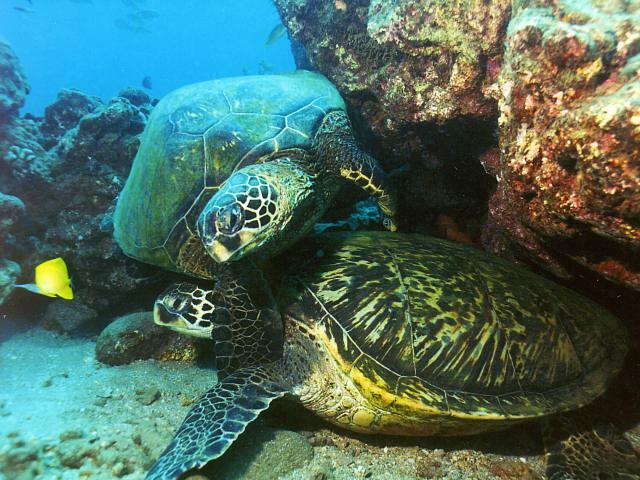 We've frequently written about the way turtles enjoy annoying other turtles. 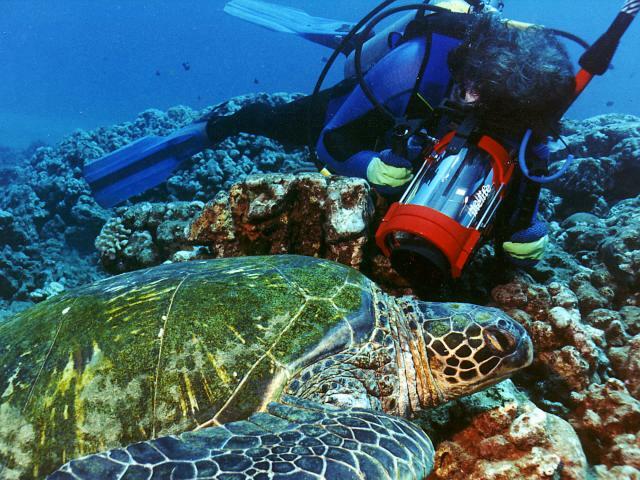 The more peaceful and serene a honu might be, the more likely she is to attract the attention of another. The resting turtle is TAMU, a turtle we've known since 1995 and who matured into a male during our observation time. 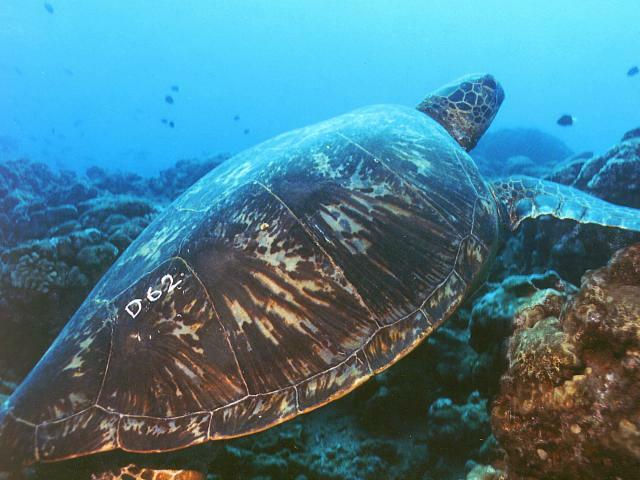 The turtle doing her best to sit on his head is Pu'u, a new sighting for 1998. Pu'u got her name quickly and easily. "Pu'u" means "bug" in Hawaiian and that is exactly what Pu'u likes to do. While she prefers bugging other turtles, she has made me a target on several occasions as well. 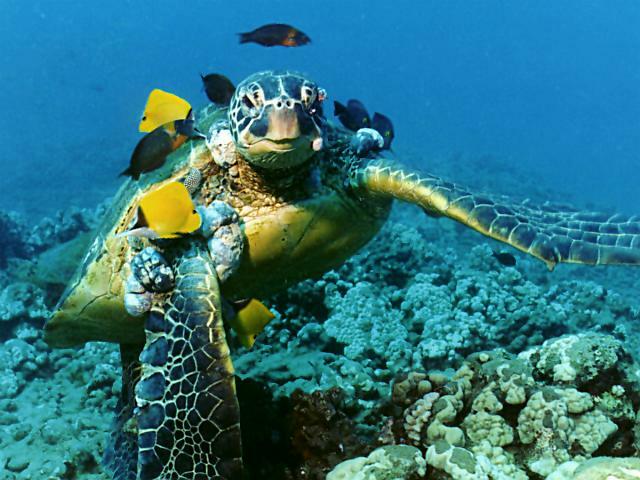 Turtle 1998 #33, a male sighted for the first time in 1997, attracts four species of cleaners. Goldring surgeons are usually considered to be shell cleaners, but at Honokowai they "work" the tumors as well. We've documented saddleback wrasses and white spotted tobies that have been targeting tumors since 1989, and our video record shows tobies to be the primary tumor-cleaning fish in our area. In 1995, the five or six longnose butterflies resident at one area of our dive site, The Rock, "became" tumor cleaners. They continue to be the only longnoses that clean, and we continue to wonder why. The Arribada: George Balazs, Denise Ellis and Marc Rice help Polzbarney, a good friend we've known since 1995. Turtle handled the whole thing better than we did. We remain grateful to George and his staff for the assistance and expertise they provided in their stay with the Honokowai honu. 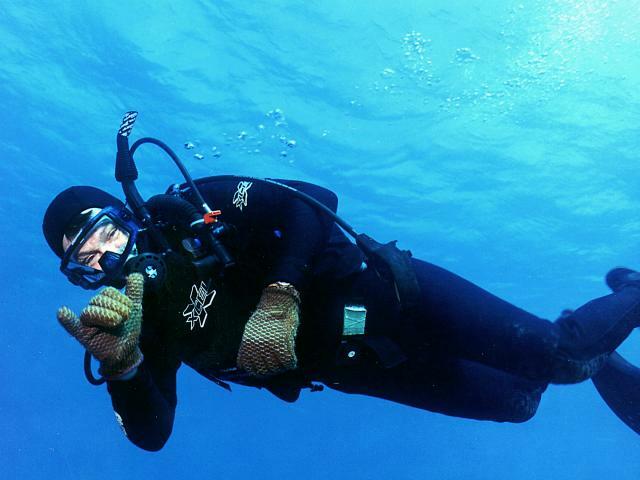 George Balazs gives the "shaka" sign as we head out towards the Turtle House during an early morning dive. The evening of June 29th, we received a message on our answering machine informing us that Mendelbrot (U 359) was spotted at East Island, French Frigate Shoals, nesting on June 6, 1998. On the morning of August 16th, we sighted her at Honokowai. Her migration there and back was complete! Here, she rests at the Turtle House, displaying a freshly painted D 62 on her shell. 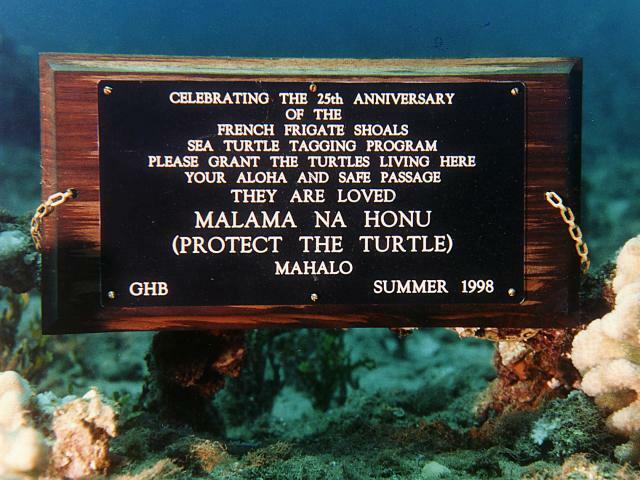 One of two plaques we laid down at our dive site to celebrate the 25th Anniversary of the French Frigate Shoals sea turtle tagging programme, and to request safe passage for the honu who call Honokowai home. Ho'oulu (A/K/A Gotcha) poses with Osha Gray Davidson,, another expert--this one a writer who stayed on Maui for two weeks to dive with the Honokowai honu. Osha presented a special lei to Ho'oulu and her cohorts on this dive.